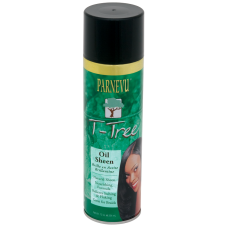 PARNEVU T-Tree Oil Sheen adds a brilliant luster to dry, dull hair. Our unique formula, containing nature's finest Tea Tree Oil, helps to stop itching and flaking from severely dry hair and scalp. 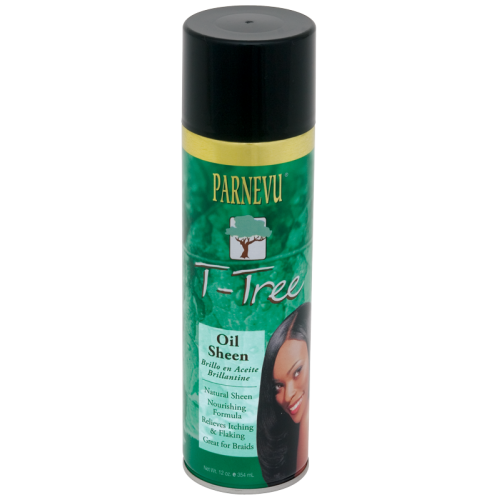 Tea Tree Oil naturally contains ant-bacterial and anti-inflammatory properties which help to nourish the hair while providing a beautiful finishing sheen, perfect for all hairstyles. Our naturally light formula will not leave hair stiff or sticky. Directions for Use: Hold can in an upright position, 10-12 inches from the hair and spray evenly. May be applied to wet hair or rollers before styling. Use as a finishing spray on dry, styled hair for a polished look. Light enough for everyday use on fine hair, braids, extensions, and hair pieces. Size: 12 oz. / 354 ml. INGREDIENTS: Glycine Soja (Soybean) Oil, Isobutane, Propane, Mineral Oil, Lanolin Alcohol, Parafin, Petrolatum, Linoleamidopropyl Ethyldimonium Ethylsulfate, Dimethyl Lauramine Isostearate, Melaleuca Alternifolia (Tea Tree) Leaf Oil, PVP Iodine, Retinyl Palmitate, Tocopherol, Hydrolyzed Silk, Propylparaben, Isopropyl Myristate, Fragrance (Parfum).